First off, Random.org says congratulations to Stephanie–she’s our big winner of What to do in Line: Disneyland! Thanks to everyone who entered! 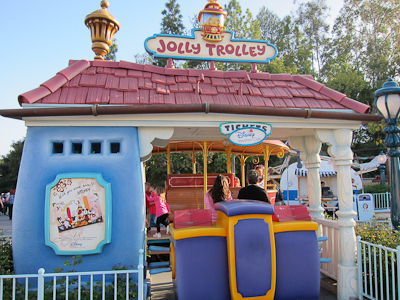 I have covered the beautiful Jolly Holiday Bakery and Cafe, so now it’s time to head to the back of the park for another Jolly experience–the Jolly Trolley in Mickey’s Toontown! Wait, is that a Disney Vacation Club sign? 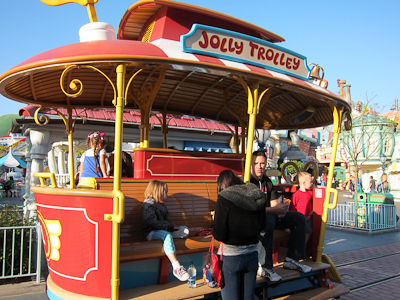 The Jolly Trolley sits right in the heart of Toontown and it used to run a loop from one end of Toontown to the other. Actually, exactly like these, since these are the original tracks. Have you noticed I’m speaking of it in the past tense? Yes, unfortunately, the Jolly Trolley doesn’t run anymore. Rumor has it that it appears to be a victim of its own popularity. 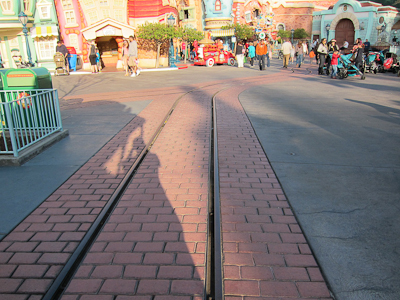 As Toontown grew in popularity, it became more crowded, and people were constantly blocking the tracks. Sort of like the Main Street vehicles, which they also don’t run at crowded times. I mean, can you even imagine that Main Street car with its honk honk horn moving approximately 0 miles per hour trying to thread its way through post-parade traffic? Insane. 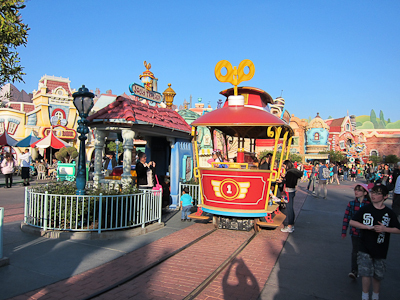 Anyway, so the Jolly Trolley remains stationary, and a fun place to take a picture or sit for a short while. 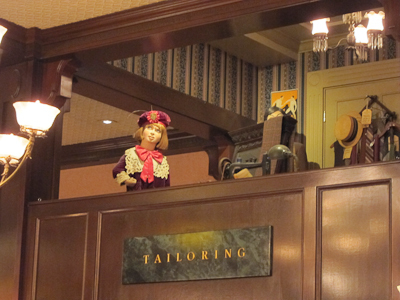 Like everything else in Toontown, the theming is whimsical and fun. But now, sadly, it’s used as a Disney Vacation Club outpost (although not 100% of the time). I never got to ride the Jolly Trolley, though I hear good things about it. Perhaps one day they will bring it back. 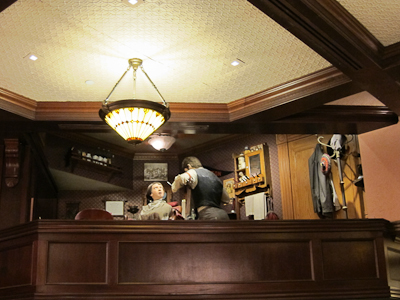 Maybe put one of those cow catcher things on the front to just plow through guests who happen to get in the way. Heh. 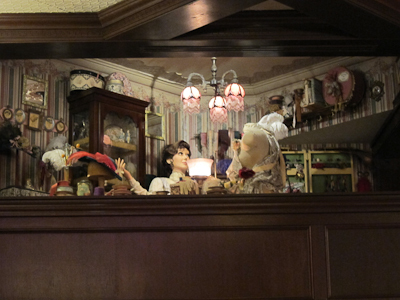 Today I’m going to talk about the Jolly Holiday Bakery Cafe. Jolly Holiday is new and in a word, simply splendid. Well, two words. Anyway, it’s lovely. Don’t “splendid” and “lovely” sound like words Mary Poppins would use? I can’t remember–it’s been a while since I’ve seen the movie. It’s named after Mary Poppins, by the way. 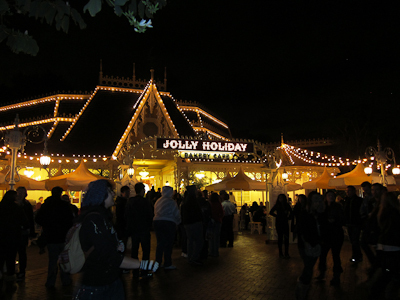 The Jolly Holiday occupies what I previously called the Single Most Wasted Space In The Entire Park back in July 2011, the Plaza Pavilion being used as the Annual Pass processing center. 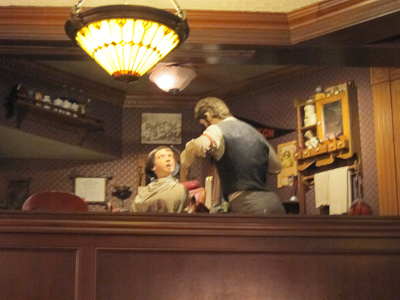 But shortly after that they closed down the AP processing and remade the Plaza Pavilion into the Jolly Holiday Bakery Cafe, and I’m ever-so-thankful. Don’t stay away too long? Don’t worry–I won’t! 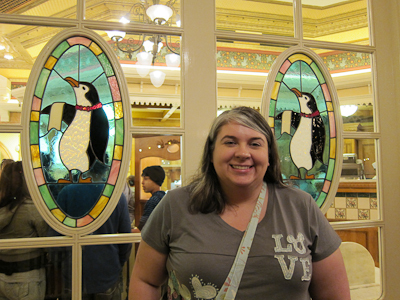 I was there with my friend Amy, a huge Mary Poppins fan, so she was happy to pose with the penguins. It was a bit crowded, but the line moved quickly. Inside there are lots of beautiful little touches. Disney sure knows how to do it right. Like this period wallpaper border. 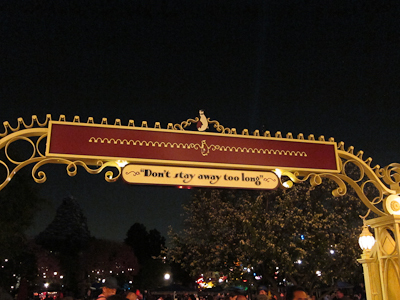 When you enter the Jolly Holiday, the line is split in half, with each half being a complete counter for service rather than one long counter. This is a fabulous setup and allows for maximum speed and space usage. 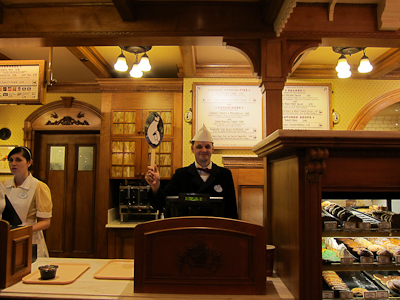 The bakery part of Jolly Holiday replaces the Blue Ribbon Bakery on Main Street, which had a terrible setup. 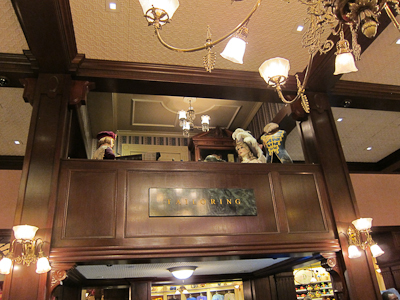 The Blue Ribbon Bakery is now a thing of the past, to provide space for an expansion of the Carnation Cafe and the Gibson Girl Ice Cream Parlor. 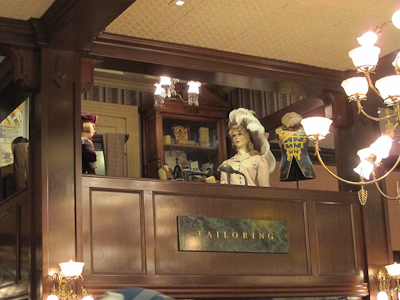 I count this as a win-win, because both the Carnation Cafe and the Gibson Girl Ice Cream Parlor seriously needed the space, and because it brought us the Jolly Holiday, with which I am in love. And another win–the Plaza Pavilion gets used as something more appropriate to its location and original incarnation (which was a buffet restaurant). 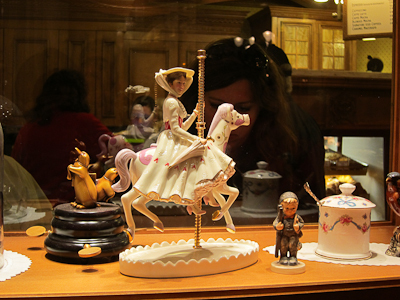 Mary Poppins knicknacks are held in glass cases. Love the penguin on the left. What is it about penguins that make them so lovable? 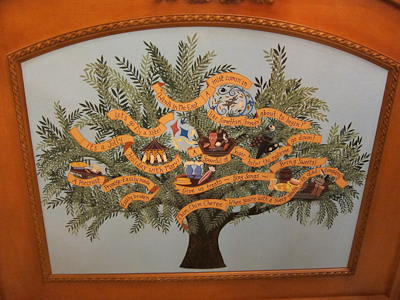 And there’s a tree mural that has a long back story, with a happy first part, sad middle part, and mostly happy ending. 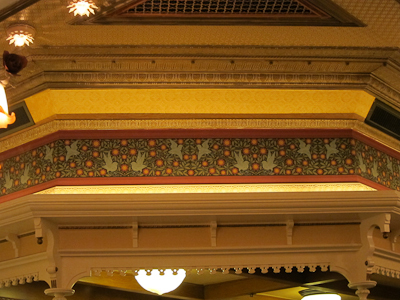 It all has to do with a beautiful mural that existed in the Plaza Pavilion that was accidentally destroyed and then lovingly re-imagined. The story is best told by former Disney artist Kevin Kidney in his first blog entry on the subject here, and his follow-up here. 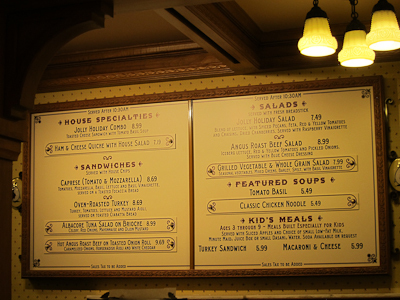 The Jolly Holiday has got it all–not just a bakery, but also a soup-salad-sandwich (both hot and cold) place. 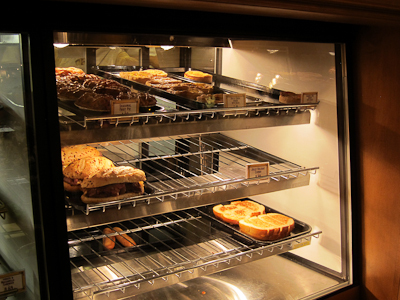 Disney has made a concerted effort to offer a greater variety of higher quality food, and the Jolly Holiday delivers in spades. I’d already eaten dinner by the time Amy and I got there, but I’ll definitely be sampling some of the offerings in the future. You can see the whole menu at allears.net. And did I mention the penguins? Because I totally love the penguins. And since the layout of the Jolly Holiday is such that the line and the service area come to a T shape, it’s difficult to see which register is open. Therefore, you follow the jolly penguin. 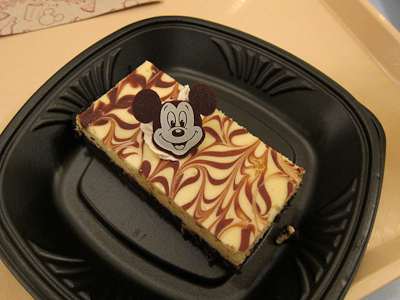 Amy and I decided to get some dessert and hot chocolate. Actually we both got Abuelita, which a Mexican-style hot chocolate (chocolate with cinnamon and a big dash of yum). I’m pretty sure Mary Poppins didn’t have her beloved old Abuelita (pet name for Grandma) but the hot chocolate version is delish. 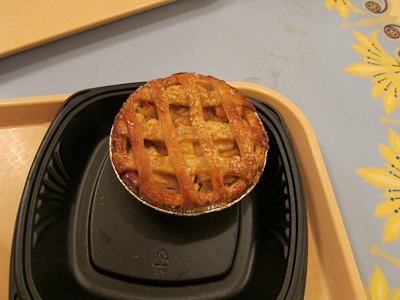 Just one day after Pi Day! 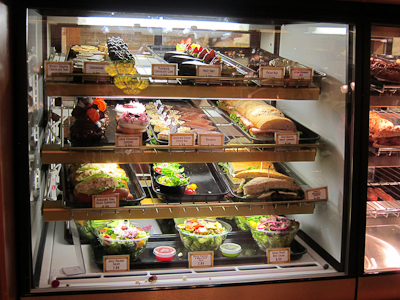 Both desserts were delicious, and there were other great-looking options as well. If I’d been more hungry, I would have gotten the cinnamon roll, but it was roughly the size of my head and I’d just been eating. Okay, that’s an exaggeration. It’s pretty much the size of Theo’s head. Maybe I’ll go just for breakfast.